Police confiscated neo-fascist paraphernalia including flags and banners. File photo: Thousands of nationalists and far right members marched to celebrate 100th Independence Day under the slogan 'we want God'. 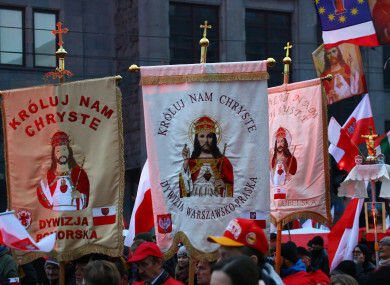 Anti-abortion activists joined the march through the center of Warsaw. TWO MEN HAVE been detained in Poland on suspicion of spreading fascism by organising a concert to mark Adolf Hitler’s birthday. The men, who have not been identified, were detained during a series of raids in Dzierzoniow yesterday evening by around 300 policemen and agents from Poland’s Internal Security Agency. Tomasz Orepuk, spokesman for the district prosecutor’s office in Swidnica, south-western Poland confirmed that the Polish men, the main organisers of the concert, were arrested yesterday and are being questioned today. Around 100 people showed up for the concert, according to Orepuk, and police confiscated neo-fascist paraphernalia including flags and banners. The public propagation of totalitarian ideologies like fascism or communism and ethnic or racial hatred is banned in Poland, a country still grappling with the memory of Nazi occupation, and carries a penalty of up to two years behind bars. The raids in Dzierzoniow came as hundreds of neo-Nazis massed on Friday, Adolf Hitler’s birthday, just over the border in the eastern German town of Ostritz for a weekend festival. Citizens and anti-fascist groups staged spirited counter-protests. In January, Polish prosecutors charged three men for allegedly propagating Nazism after hidden camera footage of a group celebrating Adolf Hitler’s birthday sparked public uproar. Legal measures have since been taken aimed at banning the far-right Pride and Modernity group associated with the men. World War II erupted when Nazi Germany invaded Poland in September 1939. Some six million Polish citizens, half of whom were Jewish, perished under the Nazi occupation that lasted until 1945. In November, leaders of the governing right-wing Law and Justice (PiS) party spoke out against xenophobia after several government ministers initially defended a controversial Independence Day march organised by nationalist and far-right groups. It drew 60,000 participants and a chorus of condemnation from around the globe over openly racist banners and slogans. While many marchers denied membership of or sympathy for extreme right groups, the event also drew representatives of far-right parties from across Europe. Email “Two Polish men detained on suspicion of spreading fascism by organising Hitler birthday concert”. Feedback on “Two Polish men detained on suspicion of spreading fascism by organising Hitler birthday concert”.